As part of the global financial services firm's corporate responsibility efforts, JPMorgan Chase & Co. once again partnered with ABS-CBN Lingkod Kapamilya Foundation, Inc. in support of the latter's Kapit Bisig para sa Ilog Pasig and Bantay Kalikasan programs. For 2 Saturdays in July, Estero de Pandacan and La Mesa Watershed and Ecopark became the venue for the firm's Good Works Volunteers' effort with over 500 of its employee volunteers and senior executives - a good number of which work during the night shifts - taking part in a variety of clean-up and tree-planting activities. 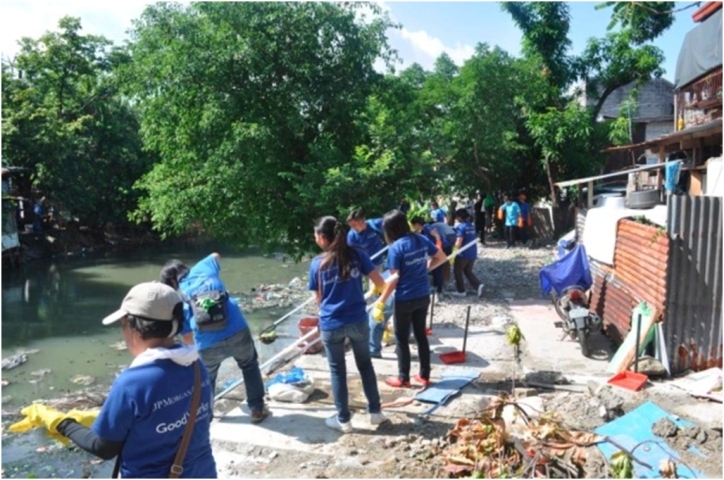 JPMorgan Chase Philippines' Senior Country Officer Roberto Panlilio shares, "We are very proud of our employees, who selflessly dedicate their time off from work on weekends to engage in and organize volunteer initiatives in support of our firm-led Good Works Volunteers’ effort. Our employees’ strong participation in different philanthropic initiatives is the very essence of what makes our corporate responsibility initiatives sustainable and most impactful to the communities we support". The bank and its employees are set to lead additional tree planting activities in La Mesa in the months of August and September this year. Kudos to JPMorgan Chase KAPAMILYA!